The Mt Baker Recreation Areas, Some Notes on Geography and History. Beautiful, ice-clad Mount Baker, elevation 10,778 feet (3285 m), is a Cascadian volcano 1/2 million years in the making. As a result of the subduction of the Juan de Fuca tectonic plate under the North American plate, numerous volcanic eruptions, and subsequent lava, cinder, and mud flows have spilled forth from the mountain, most of which are long since eroded by centuries of glaciation and dramatic weather. Mount Baker is the second most heavily glaciated of the Cascade volcanoes, surpassed in volume only by Mount Rainier. The actual volume of snow and ice on Mount Baker (about 0.43 cubic miles or 1.8 cubic kilometers) is greater than that of all the other Cascades volcanoes (except Rainier) combined. The present-day cone is relatively young, perhaps less than 30,000 years old, but it sits atop a similar older volcanic cone called the Black Buttes which was active between 300,000 and 500,000 years ago. Much of Mount Baker's earlier geologic record was eroded away during the last ice age (which culminated 15,000-20,000 years ago), by thick ice sheets that filled the valleys and covered much of the region. In the last 14,000 years, the area around the mountain has been largely ice free, but the mountain itself remains heavily mantled with snow and ice. There are various accounts of activity at Mount Baker in the mid-1800's. An eruption in 1843 resulted in a major fish kill in the Baker River, a large forest fire, and a dusting of volcanic ash over the adjacent wilderness. Further eruptions occurred in the 1850's and the first expedition to Sherman Crater in 1868 reported active fumarole fields. Steam activity continued at Sherman Crater and at the Dorr fumarole field on Baker's north flank until the 1940's and 1950's, by which time steaming was uncommon. After resumption of mild activity in the 1960's, a major episode of steam activity persisted at Sherman Crater from March 1975 to early 1976. On cold winter days, steam still can often be seen puffing up from Mount Baker. Mount Baker is drained on the north by streams flowing into the North Fork Nooksack River, on the west by the Middle Fork Nooksack River, and on the southeast and east by tributaries of the Baker River, which empties into the Skagit River about 9 miles (14 km) southeast of Mount Baker. The rivers were the route of earliest access to the mountains by humans. Several key dates in recent history are highlighted below, focusing on the North Fork Nooksack River valley. 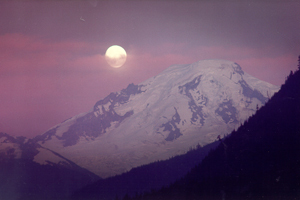 An early name given to Mount Baker by Native Americans was "Koma Kulshan." Various translations abound, including "broken or damaged", " blown off", "to shoot" or "Great White One." Spanish mariner Gonzalo Lopez de Haro sees the mountain from sea and plots Mt. Baker on his map as "La Gran Montana del Carmelo." In 1792 an English lieutenant by the name of Joseph Baker sights the mountain from the deck of Captain George Vancouver's sloop Discovery in the Strait of Juan de Fuca. Captain Vancouver names the mountain in Lt. Baker's honor. In the early 1800's there was apparently some use of the North Fork River area by a small population of Nooksack Indian that were generally located in the lower elevations downstream. To date, any prehistoric sites in the "Glacier District" remain unidentified. The first white trappers and explorers begin to visit the valley. Henry Custer, while working as a topographer for the United States Boundary Survey, is the first white man to visit and write down a record of his observations in the North Fork Nooksack valley. On August 17, 1868, at 4 p.m., Englishman Edmund Coleman and three others summit Mt. Baker. Carthage Kendall files a homestead at Kendall. Alfred Loop files a homestead west of Boulder Creek. This site (now the site of Alpenglow Farms) becomes the end of the wagon road from which prospectors and miners leave on foot to the upper valley. The Loop family later establishes Loop's Inn to accommodate the "traffic" of the Mt. Baker Gold Rush. H.C. Wells, Banning Austin, and other early prospectors and surveyors explore the upper North Fork valley and name Wells Creek and Austin Pass. The state road commission pushes a "state trail" to Ruth Creek. Jack Post of Sumas begins prospecting in the upper North Fork valley areas. Jack Post files the Lone-Jack Claim which starts the Mt. Baker Gold Rush. A toll bridge is constructed across the Nooksack River at Thompson's Falls (now Nooksack Falls). The Great Excelsior Coal Mine is discovered. Construction of a hydroelectric plant at Nooksack Falls begins. The plant is put into operation in 1906 and provides early electrification to Whatcom County. This small renewable energy plant operated for over ninety years with no significant adverse environmental impacts and provided many significant long term benefits. A fire closed the plant in 1997. The powerhouse is now on the National Register of Historic Places. The first successful summit climb of Mount Shuksan (elevation 9127 ft.; 2782 m) is made by famous Northwest photographer Asahel Curtis and W. Montelius Price on September 7, 1906, via the Sulphide Glacier. The first forest service headquarters in the Mount Baker Region of the Washington Forest Reserve is built on Gallop Creek in the town of Glacier. The Mt. Baker region is included in the newly-created Washington National Forest (the name was later changed to Mt. Baker National Forest in 1926). A new ranger station is built east of Glacier at the national forest boundary. The Bellingham Bay and British Columbia Railroad is completed to the town of Glacier. The City of Glacier is platted. The first major logging occurs in the upper North Fork valley. On August 11, 1911, the first Mt. Baker Marathon is run from Bellingham to the summit of Mt. Baker and back. The Mount Baker Highway- an eight-foot wide gravel road- is constructed from Excelsior to Shuksan. Gasoline-powered trucks with solid rubber tires begin to replace railroads as a means of moving timber from the valley's forests to the mills. The Mount Baker Highway is extended to Heather Meadows. A new summer resort is constructed and includes the beautiful new Mt. Baker Lodge, the Annex- and across Sunrise Lake with stunning Mt. Shuksan as a backdrop- the smaller Heather Inn and a few cabins. A small hydroelectric plant is constructed on Bagley Creek to supply electricity to the resort. A few hardy souls begin using the Mt. Baker resort area for skiing in the winter when the lodge is closed. In January 1929, the Mt. Baker Club puts on a skiing party. Members drive to Glacier, spend the night in a cabin, and then hike from Glacier to Heather Meadows. A group of 21 people has lunch at the stone cabin with winter caretakers Carl Steiner and Thor Johnson, then skis down the slopes in front of the Heather Inn. The Great Depression causes the bankruptcy or closure of the mines in the Glacier Mining District. The Mt. Baker Lodge burns to the ground. In the summer of 1932, the Heather Inn re-opens to serve sightseers and hikers. The Civilian Conservation Corps builds numerous roads, campgrounds, trails, cabins and fire lookouts in the area. The first major motion picture (The Call of the Wild) is filmed at Mt. Baker and along the banks of the North Fork Nooksack River, starring Clark Gable and Loretta Young. The Pacific Northwest Ski Association holds a ski jumping meet at Razor Hone Hill. US and Canadian national skiing and jumping champions participate in the event. During the WWII, shortages of gasoline lead the highway department to cut back their operations at the mountain. The Heather Inn is closed and the Annex is boarded up. Not even a caretaker remained at Heather Meadows for the remainder of the War. A new company is formed to get the ski area going again. The Heather Inn was renovated and used as a dormitory , but the after two winters' use the roof caved in and the structure was dismantled. On July 4, 1948, the Koma Kulshan Ski Club organized a giant slalom race and promoted the event as the only ski tournament in the country during the month of July. This was the unofficial beginning of a long tradition of spontaneous and merry July 4th "Slush Cup" events that lasted into the 1980's, until the U.S. Forest Service alleged damage to the alpine environment and shut down the Slush Cup. The first chair lift (Pan Dome) is constructed at Mt. Baker Ski Area. On October 2, 1968, North Cascades National Park is created to the east of the Mount Baker and North Fork Nooksack valley areas, encompassing Mt. Shuksan and the inner core of the North Cascades. The first "Ski to Sea" race is promoted and run from the Mt. Baker Ski area to Bellingham Bay. A light aircraft landing area is established near milepost 27. At 8:32 a.m. on May 18, 1980, a loud boom is heard throughout the North Fork Nooksack valley as Mt. St. Helens erupts ___ miles away. Numerous new small hydroelectric projects are proposed on high mountain tributaries of the North Fork Nooksack River to provide a clean renewable energy alternative to a growing number of fossil fuel plants and the increasing air pollution from urban development in Puget Sound and the lower mainland of British Columbia. One proposal involves resurrecting the 1927 Bagley Creek power plant that supplied electricity to the original Mt. Baker Lodge. Recreation and tourism begin to replace logging as the primary economic activity in the valley. The 117,500-acre Mt. Baker Wilderness is created. Its eastern border is shared with the boundary of the North Cascade National Park for a distance of 40 miles. The Wilderness extends north from State Highway 20 along the Skagit River to the Canadian border. The Mt. Baker Highway is designated as a National Forest Scenic Byway from Glacier to its end at Austin Pass (24 miles). A large new ski lodge is constructed at the Mt. Baker Ski Area. In July, Alpenglow Farms opens for business on the Mt. Baker Highway at the site of the old Loop Ranch, providing berry shakes to thirsty hikers and sightseers. The heaviest seasonal snowfall is measured at Mt. Baker Ski Area.